Big Finish: Doctor Who - MASTERS OF LUXOR Review | Warped Factor - Words in the Key of Geek. Matthew Kresal discovers a lost story from the Hartnell era. The Big Finish version of The Masters Of Luxor was a long time coming. Having been originally commissioned to be the second ever story for the series before being replaced by Terry Nation's first Dalek tale, it remained in obscurity until its script published in book form in the early 1990s. It was nearly twenty years later, and some forty-nine years after it should have aired, before Big Finish's adaptation was released. Was it worth the wait? Unlike the usual full-cast audio dramas that Big Finish normally releases for Doctor Who, the 2012 production of The Masters of Luxor was done instead as an “enhanced talking book”. To explain the format, writer Nigel Robinson took the Coburn script and turned it into what is effectively prose in a process he'd used successfully on the earlier First Doctor Lost Stories Box-Set. The prose is read by actors William Russell and Carole Ann Ford (who reprise their respective roles as Ian and Susan from the television series, as well as narrating the story and also taking the parts of the First Doctor and Barbara). Joining them is actor Joseph Kloska who reads in the various robots as well as the major supporting roles of The Perfect One and Tabon. The result is a cross between a novelization of the scripts and one of Big Finish’s Companion Chronicles releases. The adaptation by Robinson of the original Anthony Coburn scripts is largely faithful. Robinson keeps the six episode structure and also retains the originally written cliffhangers. But instead of keeping the story in its originally intended placement, it is shifted to after the previous First Doctor adventures in the Lost Stories range. It also keeps the originally written cliffhangers despite some of them being rather odd (the first episode cliffhanger is a good example) which nevertheless helps make it faithful to the original scripts in that regard anyways. Robinson though makes some changes of his own. Due to the lack of descriptions given in the script, Robinson was largely given free rein to create descriptions for the characters and sets. The Mark One robots descriptions seem to come out of 1950s B-movies, while the Derivitrons were based, by Robinson’s own notes for the CD booklet, on the Miranda robot from the classic silent film Metropolis. For The Perfect One and Tabon, Robinson took note that the name seemed to come from the discovery of the so-called ‘Tabon Man’, a fossilized early humanoid discovered in the Philippines the year before Coburn wrote his scripts. As a result, the characters were given a description somewhat Asian in appearance with skin “the color of pale honey.” The devices used for The Perfect One’s experiments are also taken from the aforementioned Metropolis as well. Some of Robinson’s characterization, where he was allowed to fill in gaps in the script, can be a bit odd as well. A perfect example being a moment early on where Susan daydreams about being kidnapped “half naked” by one of the robots. While this is perhaps befitting any number of B-movies from the 1950s and 1960s, it feels odd coming from this character, even if Carole Ann Ford is reading it. The production also significantly reduces the religious subtext found in the script. The main result of this is that a pivotal scene in Coburn's episode six has been cut out completely, as well as the hymn sung by Susan and Barbara being changed from Onward, Christian Soldiers to the somewhat less religious hymn Jerusalem. Given that the point of the Lost Stories range is to present stories from the era, this change in emphasis (while having its reasons) seems odd as surely the point is to present the story, even with some possibly anachronistic themes, intact. As mentioned earlier, this has two of the series original cast members both reprising their roles and narrating the story. William Russell and Carole Ann Ford, having done similar jobs on The First Doctor Box-set as well as their work on the Companion Chronicles, are well versed in this style of production and are the definite highlight of this release. Their performances also brings out the best parts of the original Coburn script, such as Ian’s “the projectionist has gone home” line in the first episode. Joseph Kloska’s performances as the various other characters is the icing on the cake, giving Russell and Ford a fine actor to bounce off in their scenes together. In fact, there are some instances with Kloska's playing off himself which he proves more than up to. The sums of their performances give this version an air of authenticity it might otherwise lack. There's also the sound design and music. Toby Hryeck-Robinson's work on this release is superb, showing once again Big Finish's strengths on the production values side. Hryeck-Robinson creates a fine soundscape that takes in robots, a city, and a dead world, all while creating images in the mind that bring Robinson's descriptions to life. The music for this release is a particular highlight, which makes it a shame that there isn't a suite of it to listen to separately. 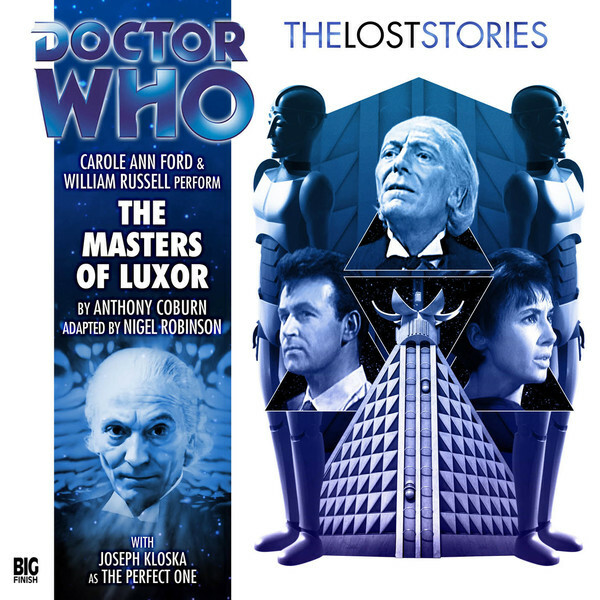 So was Big Finish's take on The Masters Of Luxor worth the wait? For me, the answer is a mixed one. On one hand, it's great to be able to hear the story brought to life at last with two of the cast members who would have appeared in it back in the 1960s. It's also a strong production from the sound design and music side of things as well, showcasing what Big Finish can do at its best. On the other hand, Robinson's sometimes excessive changes make me shake my head, as surely the whole point of doing these Lost Stories was to present them as close to how they would have been back in the day, not through 21st century eyes. It's a solid production but not quite what we would have gotten back in the winter of 1963-64 and thus I can't shake off mixed feelings about it.